Consistently in the top ten most-produced operas in the world - come see Rigoletto at the Schuster Center November 9 & 11, 2018. In this beloved work, you’ll meet one of Verdi’s most vivid characters: Rigoletto, a hunchbacked jester who earns his living by amusing the lascivious Duke of Mantua. When he mocks the anguish of a father whose daughter is a victim of the Duke, the grieving father curses Rigoletto, setting into motion this tragic tale of love, remorse, and revenge, and showcasing some of opera’s greatest hits. It is no wonder that Rigoletto is consistently in the top ten most-produced operas in the world. At the final curtain of its heart-wrenching finale, you’ll certainly be glad you came! 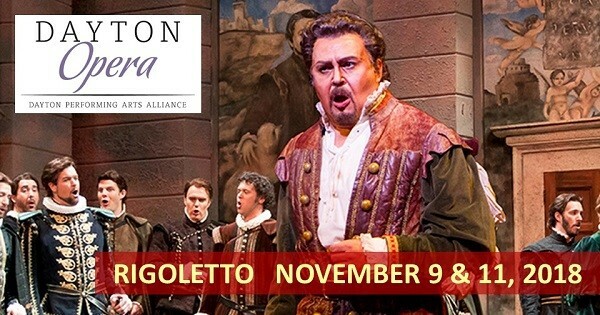 Find more events like "Dayton Opera: Rigoletto"
Dayton Opera performs in the accoustically-perfect Mead Theatre located in the Benjamin and Marian Schuster Center.